Qatar – 16th May, 2016: Qatar International Golf Club (QIGC), a new world-class golfing destination with a revolutionary approach to golf is working to become one of the most sustainability led golf developments in the world as it confirms its aim to become a GEO Certified® Development. An early adopter of the programme, QIGC began its partnership with GEO (the Golf Environment Organization), a non-profit organization that is dedicated to supporting the global golf community in sustainable development, in 2012. QIGC is currently working through GEO’s OnCourse® Developments programme to achieve GEO Certified® Development status with the aim of maximising the role of the project in enhancing nature, conserving resources and supporting local communities. QIGC’s achievements as part of the programme will centre around three main pillars – resource efficiency, nature enhancement and social value. The project is committed to delivering a wide range of net positive benefits in these areas. Resource efficiency is a key element of sustainability at QIGC. Compared to the regional industry average, QIGC will benefit from 1,400 cu. m. less water utilization per month thanks to factors including large areas of drought and heat-tolerant planting, the minimization of turfgrass areas and smart irrigation and sprinkler systems. A root zone design that creates a perched water table under all grassed areas, the choice of Platinum TE Paspalum as a main grass type due to its salt tolerant capabilities and a drainage system which retains and recycles excess irrigation and rainwater also support the reduction in water usage on site. Solar panels, energy efficient lighting and a zoned flood-lighting system will also contribute to reduced energy consumption. Wastage on-site is sorted to ensure the maximum amount of material can be recycled. In terms of nature enhancement, the development will use predominantly native Qatari plant species whilst a series of naturalised lakes and the restoration of an old Wadi will provide resources for migratory birds to colonize in the region. Bird boxes are already installed in the most complete areas of the development to encourage habitation. 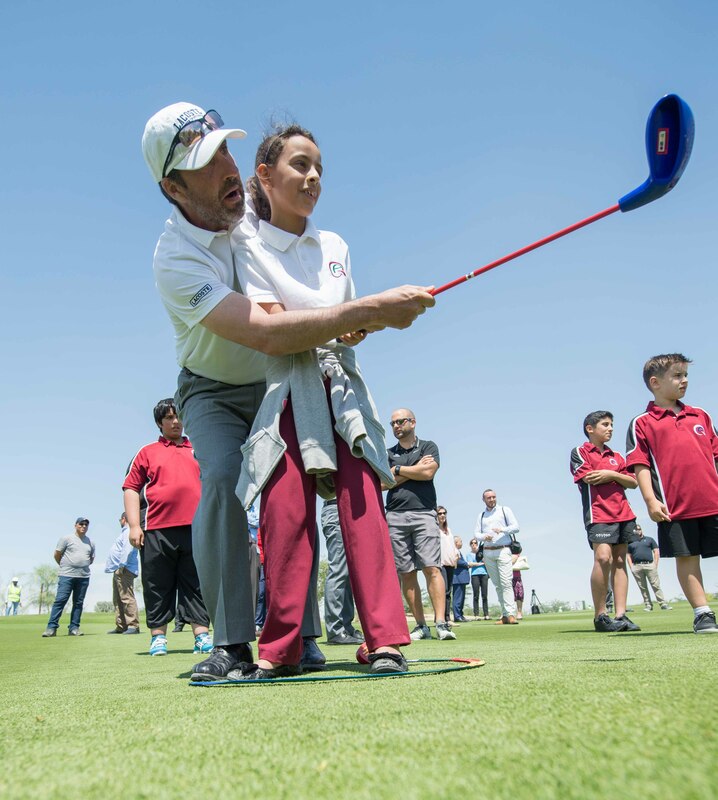 The development has already started showing its contribution to the local community through the live Pearl Coaching Programme, which aims to get golf clubs into the hands of 4,000 school children during the construction phase of the project. QIGC continues to provide opportunities for the community to take part in fun golf-themed activities in the lead up to the opening of the development, through various activities such as the most recent event for Qatar National Sports Day.